The moment we’ve all been waiting for has finally arrived. Though they have already been leaked repeatedly in the days and weeks leading up to today’s event, Apple has officially confirmed the iPhone Xs and iPhone Xs Max, which will serve as the company’s two flagship smartphones for 2018. The iPhone Xs will feature a 5.8-inch OLED display, while the Xs Max will boast Apple’s largest phone display to date, measuring in at 6.5 inches. As expected, the designs of the two new iPhone models closely mirror the iPhone X, with edge-to-edge displays and notches to accommodate the front-facing sensors and cameras. As the ‘S’ in the name would suggest, the upgrades this year are mostly internal, with more drastic design changes expected in 2019. While the design might be familiar, the iPhone Xs and Xs Max will be more powerful than their predecessors and offer more configurations for consumers. In addition to 64GB and 256GB models, Apple will also offer a 512GB model. This is the first time Apple has given iPhone fans the option to own a phone with half a terabyte of storage. Apple is also offering three color options this time around: Gold, Silver, and Space Gray. The iPhone Xs features a 5.8-inch Super Retina OLED display at 2,436 x 1,125 resolution with 2.7 million pixels and 458 pixels per inch. These specs are virtually identical to those of the iPhone X, but Apple says the Xs uses the most durable glass ever on a smartphone. Plus, Apple says the the Xs display has 60% greater dynamic range than that of the X. Oh, and the Xs is even more dust- and water-proof than the X. 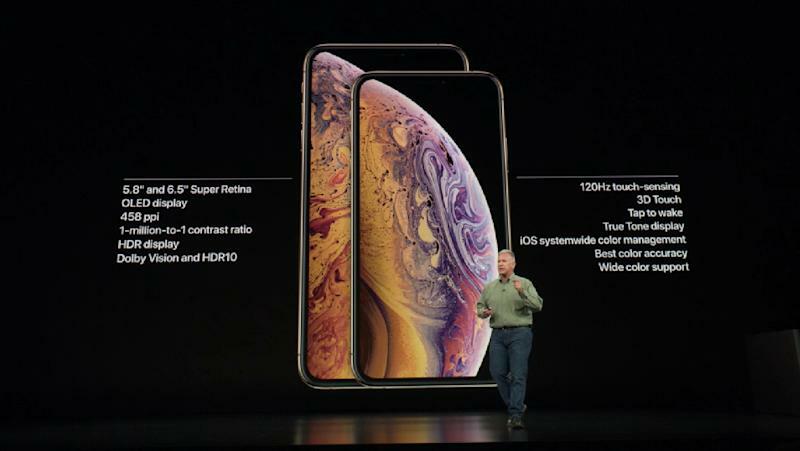 The iPhone Xs Max, on the other hand, features a 6.5-inch Super Retina OLED display at 2,688 x 1,242 resolution with 3.3 million pixels (but still 458 ppi). The Xs Max is almost exactly the same size as the iPhone 8 Plus, despite the fact that its display is a full inch larger. Other than that, the Xs and Xs Max are nearly identical. 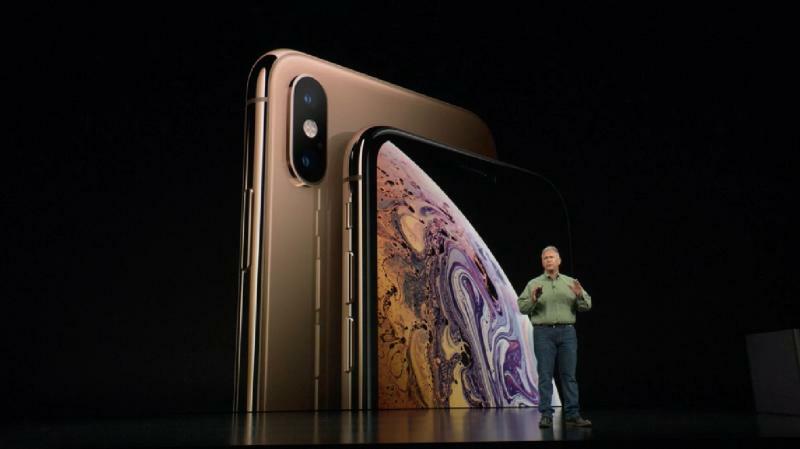 Apple has also improved the camera system, as the iPhone Xs will ship with a 12-megapixel wide angle camera with an all new sensor (f/1.8), a 12-megapixel telephoto camera (f/2.4), and improved True Tone flash. Then there’s the 7-megapixel front-facing camera (f/2.2) with a faster sensor than the iPhone X. There are many software improvements as well, including a new feature called Smart HDR that adjusts the light in the shot automatically, even if you’re taking a photo while facing the sun. You can even change the depth of field after you’ve taken a photo. Apple didn’t leave video out though, as you can now record stereo sound on the iPhone Xs. And now we come to perhaps the most important feature for many users: battery life. Apple says that the iPhone Xs will last 30 minutes longer than the iPhone X, while the iPhone Xs Max will last an hour and a half longer. Finally, as rumored, Apple is bring dual SIM support to the iPhone Xs and Xs Max as well. With two SIM cards, you can keep two phone numbers, use two different plans, and travel with a local plan abroad. The new phones will also ship with eSIM support, though this requires support from the individual carrier. That said, iPhone Xs and Xs Max models sold in China will have two physical SIM models though, without eSIM support. Preorders for the iPhone Xs and iPhone Xs Max will open this Friday, September 14th, with shipments slated to begin next Friday, September 21st. iPhone Xs starts at $999, while Xs Max starts at $1,099. If you want more flash storage, you can pick up a 256GB iPhone Xs for $1,149, a 512GB iPhone Xs for $1,349, a 256GB iPhone Xs Max for $1,249, or a 512GB iPhone Xs Max for $1,449 (easily the most expensive iPhone to date).